The ICC Cricket World Cup is the flagship event of the international cricket calendar and takes place every four years, with matches contested in a 50-over format. 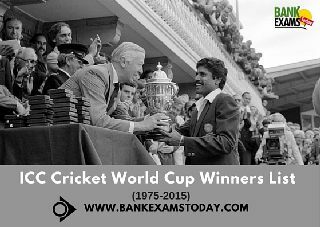 The first tournament took place in England in 1975 which was won by the West Indies. The most recent event was held in 2015 which was won by Australia. Australia Cricket Team is the most successful team in ICC world cup tournament as they become world champions five times in 1987, 1999, 2003, 2007 and 2015. India and West Indies have won world cups 2 times each. West Indies won first two cricket world cups 1975 and 1979.